Lapasset is currently the International Rugby Board chairman having secured a second four-year term as the sport's top administrator in December 2011. Lapasset began his life in rugby with a playing career at Paris Université Club and Agen, with whom he won the French Junior Championship in 1967. 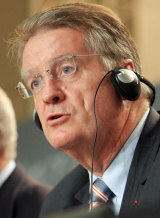 Lapasset's real success within the game began when he took the position of General Secretary of the Fédération Française de Rugby (FFR) in 1991. Within a year of taking this position, Lapasset was elected as president of the FFR - a position he held until taking on the chairmanship of the IRB. Lapasset was originally elected to the position of IRB chairman in 1995, and oversaw the advent of the professional game. He returned to the IRB Council in 1996, representing France, and remained an important part of the high performance committee for the next decade. In 2004, Lapasset was nominated as the president of the organising committee for the 2007 Rugby World Cup in France. He oversaw the most successful tournament ever, with record gates and a carnival atmosphere surrounding the whole event. In his first year as IRB chairman, Lapasset supervised the introduction of the controversial Experimental Law Variations, first into a trial in the southern hemisphere Super 14 and from August 1, 2008, globally. He went on to oversee the successful bid to have Sevens recognised as an Olympic sport in 2009 - with the sport set to return to the Olympic programme at the 2016 Games in Rio - and also played a role in Argentina's promotion into an expanded Tri-Nations tournament with the Pumas set to feature in the newly-named Rugby Championship from 2012. In the wake of the 2011 World Cup, Lapasset saw off the challenge of rival Bill Beaumont to secure a second term in office and also cast the deciding vote that saw South Africa Rugby Union boss Oregan Hoskins promoted to the role of vice chairman. Lapasset is also vice-president of the CNOSF (French National Olympic and Sports Committee) and co-president of New Zealand France Friendship Fund since 1993. He is Officier de la Légion d'Honneur and Honorary Officer of the New Zealand Order of Merit.